In a previous post in this blog (Wither the chess tournament book? ) I lamented the passing of the contemporaneous chess tournament book, fortunately there is a rich, diverse and vast literature on chess tournaments of the past. The scope of this diversity has become even more apparent with the publication of Gino Di Felice's Chess Competitions 1824 - 1970. Gino Di Felice has done a yeoman's service in compiling this bibliography. Di Felice is best known for the invaluable series, Chess Results, in which he has provides the crosstables to thousands of chess events from 1747 to 1960, with three more volumes soon to appear , which will take us to 1970. With 3096 competitions listed and 5066 publications this was mammoth undertaking, some events and publications are sure to have slipped thru Di Felice's net, but one cannot but admire Di Felice's dedication and perseverance in compiling this bibliography, and although the cut off for competitions is set at 1970, there are publications published as late 2012 in the bibliography. The bibliography is divided into five parts, part one is devoted to individual tournament, part two to individual matches, part three to team tournaments, part four to team matches and part five is devoted to correspondence competitions. The listing for individual and team tournaments are listed alphabetically according to where the tournament took place, and then chronologically for tournaments in the same city, individual matches are listed by the name of the winner or alphabetically in case of a tie. Team matches are listed under the name of the home team. As for correspondence competitions, regardless of there being tournaments or matches are listed alphabetically by name. The chess bibliophile and researcher are sure to find this book invaluable resource, and many a club chess player may also find this book useful. I would have likes a page or two of illustrations, especially some of the more obscure titles, but one can't have everything. 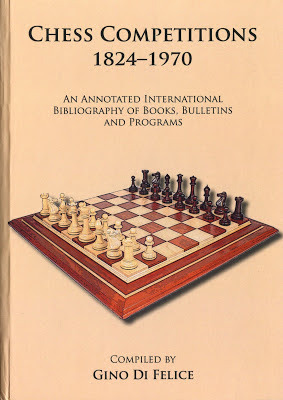 Chess Competitions 1824 - 1970: An annotated international bibliography of books, bulletins, and programs.